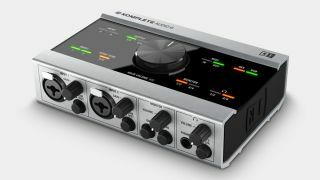 Not only is NI's Komplete Audio 6 an excellent audio interface, but it also ships with a sizeable software bundle that includes instruments, effects, DJ software and a DAW. This 6-channel interface offers four analog ins/outs, digital I/O, MIDI I/O and low-latency performance. It ships with Komplete Elements. NI's software package of more than 3GB worth of instruments and effects, Cubase LE and Traktor LE. This makes it a full music production bundle, and at $199 - a saving of $40 on the regular price - it's great value for money. A Komplete bargain, you might say.